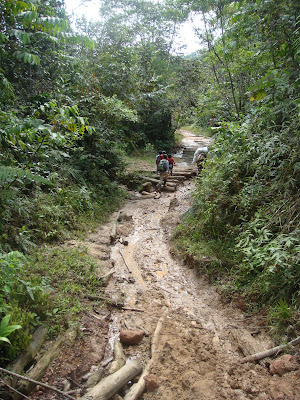 Hiking to and from the Uwihint community is possibly one of the most physically challenging things I have done to date. At a steady pace, it took 3 1/2 hours to travel 7km up and down craggy and slippery trails, through the undergrowth and across rivers in the dense midday humidity. At times I felt as though I could not go on, as when we climbed up steep hills thick with wet clay my head went dizzy and my hands and arms swelled with pressure, but my legs moved on as if disconnected from my body, pulling out of the ground and finding the next foothold. When we got to the top of each climb and could walk straigh or downhil for a while, my breath would return, until the next climb. I am sat on a bark ledge upstairs of the Shuar house we are sleeping in for the weekend. 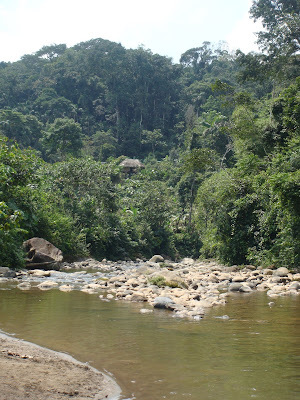 Immediately in front of me is a small hill of plantain trees leading down to a small rocky river on the left and the Uwihint school house on the right. Behind that, and on the horizon all around us, is primary rainforest. To the left of the tin-roofed school house Carlos the horse is grazing, a little respite after carrying bags of rice and sleeping mats throught the steep rainforest where he slipped and fell heavily more than once due to the tough terrain and exhaustion. There is a fire lñit in the community space, a tin roof supported by tree trunks, and a couple of boys kick a football around in the late afternoon light. Very suddenly, as I write this, the air changes and thunder approaches fast from the east. The trees start to bend and a strong wind moves closer, winding around us on all sides. 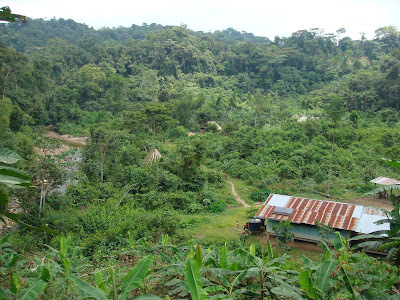 I climb down the stepladder to the ground and stand with Ramon, the president and founder of the Uwihint settlement, who points and follows the path of the wind in the forest aound us with his finger. It draws in, and pieces of thatch from the house are pulled up and dark spots of leaves and thatch float in the air above us like a cluster of strange shaped black butterflies. We eat a dinner of plantain, rice and peas under the tin roof of the community space. The small cooking fire provides some light, and also a couple of the candles that we brought with us. After dinner people gather around the fire, and two women bring their small children to the shaman to be healed. The woman sits next tot he shaman by the fire, her child wrapped in her arms. 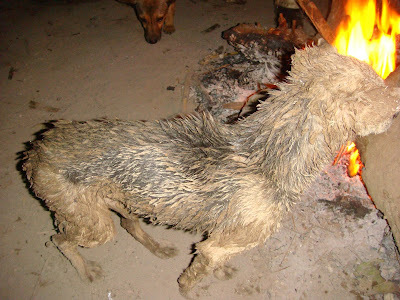 The man pulls a couple of embers from the fire and crushes them out quickly between his palms, and then rubs the ash first on the baby´s head, and then down his back. Afterwards, he ties some leaves tot he top of one of the trunks that support the roof. A little later everyone gathers in the school building, and we carry the infant chairs we are sitting on with us. Ramon speaks first, welcoming us three volunteers and the two Peace Corps workers who will be conducting a seminar on ecotourism on teh next day. The speaches are long and repetitive and the community, sitting on the floor at the edges of the school room, chatters over them. The four older men of the community take it in turns to welcome us and talk about their desire to encourage visitors to the community, the need to develop ecotourism in the community to provide an alternative to cutting the forest, what their community has to offer by means of traditional Shuar culture, the need to preserve their culture and the importance of protecting the rainforests. 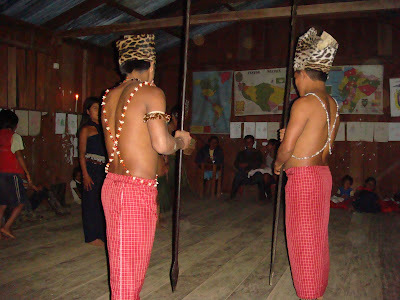 The we are given a demonstration of what the community has to offer to ecotourists, in the form of a performance of Shuar dancing. 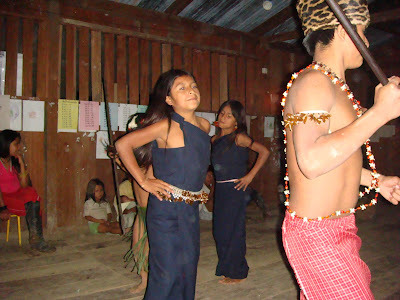 Jorge plays the pipes which four young men and girls in traditional costume dance for us. The next night (Saturday) aftrer another dinner of plantain, rice, and peas, some boys come in from the forest carrying a watusi that they have caught. Watusi is a large rodent, not dissimilar to rat except for its size. 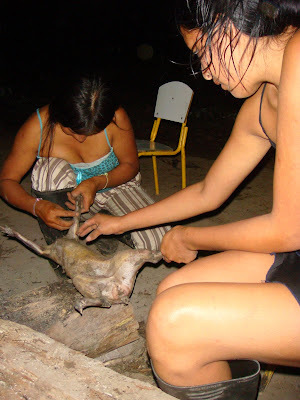 The women immediately get to it, first synging the fur and scraping it off, and then carving it into smaller peices (head, spine, and all), and popping it into a pan of water for soup. 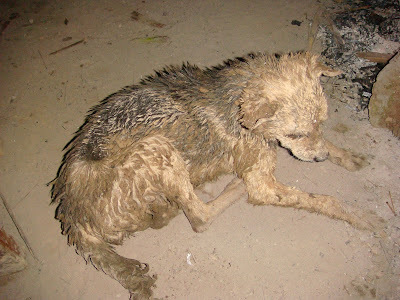 And the poor dog that caught the watusi, exchausted and covered in grime from the hole it ratted it out of, didn´t get any of it.